Ground beef with rice and vegetables, wrapped in cabbage leaves and cooked in a sweet and sour tomato sauce. Naturally gluten-free. Make ahead. Tastes even better the next day. PREPARE THE CABBAGE: Unless you have an extremely large pot, you will need to boil each cabbage separately or use two pots. Boil the cabbages for 5 minutes. Scoop cabbages out and cool under cold running water. When cool enough to handle, peel away the large softened leaves and set aside. After you peel off 6 or 7 leaves, you may need to put the cabbage back in the boiling water for a few more minutes to soften the inner leaves. When you have 25 leaves, set them aside and roughly chop the rest of the cabbage and put 8 cups of chopped cabbage into a large bowl. (if there is any remaining cabbage, use for salad or another recipe) Add the roughly chopped green pepper, celery, and sliced onion to the bowl with the chopped cabbage and set aside. MAKE THE SAUCE: Combine tomatoes, lemon juice, brown sugar and raisins in a medium saucepan. Cook over medium heat, stirring, until sugar is dissolved, 2-3 minutes. Turn off the heat and set aside. MEAT MIXTURE: Put the ground beef in a large bowl. Add eggs, raw rice, finely chopped vegetables, salt and pepper. Mix until just combined. ASSEMBLE THE DISH: Put half of the chopped and sliced vegetables into the bottom of a large heavy pot or Dutch oven. Pour half of the sweet and sour tomato sauce over the vegetables. Stuff the cabbage leaves by scooping a heaping tablespoon of the meat mixture onto the center of a cabbage leaf. Fold the thick end of the leaf over the meat (if the end is extremely thick, cut off a bit). Fold in the two sides until they almost meet in the middle. Then roll up and place onto bed of vegetables, seam side down. Continue until all the meat is rolled, making two layers of cabbage rolls, if necessary. Cover the cabbage rolls with the rest of the chopped vegetables or as much as can fit in the pot. Pour the rest of the sauce on top. Bring to a boil. Lower heat, cover, and simmer for 3 hours. 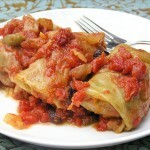 Serve cabbage rolls with sauce spooned over them and enjoy! Stuffed cabbage can be made a few days ahead and kept in the fridge. Stuffed cabbage also freezes well. One cabbage makes a great appetizer. Two or three make a perfect meal.